It is often said that Kpomo is the common man’s food, but I beg to differ slightly…Kpomo is everyone’s food. Both the rich and poor in Nigeria absolutely love their cowskin, the only difference is that the rich man has a variety of other alternatives to choose from should he decide to do away with Kpomo (haven’t I just tacitly agreed that Kpomo is the poor man’s food? Anyway let’s move on) while the poor man is stuck with the Hobson’s choice. Who in their right thinking mind bans the food of majority of the population? How can somebody wake up one day and decide to ban our precious, precious Kpomo? Who does that! The farmers are not complaining of low sales of cowskin, they didn’t ask for government intervention in this matter as far as I know, so what exactly is the problem? Placing a lid on the sale and consumption of Kpomo is not the solution to building the Tanning industry. What happened to increasing profitability by improving on the rearing of cattle to ensure there is enough hide and skin to cater for those who want to continue to consume their beloved cowskin as well as for the production of leather goods for exportation purposes. That way everybody is happy. Moreover, we all know that once something is banned in Nigeria, it automatically becomes big business with illegal trade developing as an aftermath of the ban. Some have argued that Kpomo has no nutritional value (as if we don’t know), so since it does nothing good for the body, it can as well be put into much better use. True, Kpomo has no nutritional value, but it also hasn’t been discovered to be the cause of death or terminal illness of anybody. I read a piece where the writer stated (and rightly too) that brown Kpomo is usually subjected to plenty of heat and smoke in order to remove the fur from the skin before consumption which is bad for our health as it contains some hydrocarbons. My response to this is- this is Nigeria, we boil our foods into submission, we boil all diseases out of our food. As a matter of fact if there is anything we can be accused of it will be overcooking our food, so that argument really doesn’t hold water as far as I am concerned. Besides, there are several other foods which are smoked all the time and which haven’t been banned because of that. We also have the option of the white Kpomo which doesn’t require any form of heating before consumption and so if push comes to shove we the “Association of Kpomo Lovers” will stick with that. 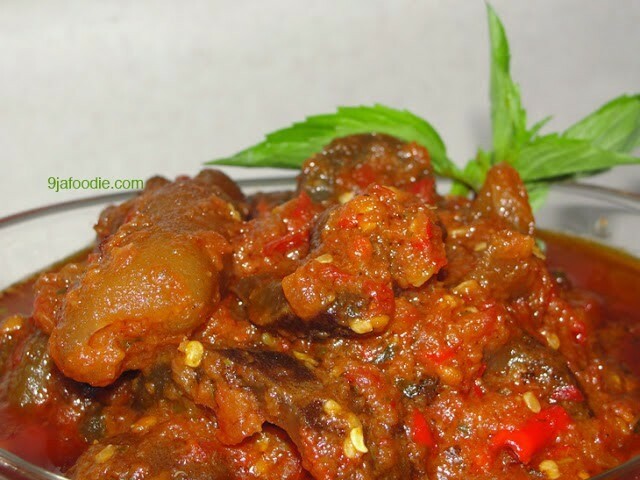 Kpomo is a core component in the preparation of several soups in various cultures in Nigeria. The adventures of eating Amala and ewedu at our favorite buka will never be the same again without Kpomo as an aide to it. Imagine cooking Efo firo, Edikaikong or Afang soup without Kpomo as part of the essential ingredients! Life without Kpomo is empty and meaningless! It is the lifeline of any soup worthy of being eaten. Kpomo has done no one any wrong, Kpomo didn’t bring about the Ebola virus, Kpomo isn’t responsible for the Boko Haram menace, Kpomo hasn’t embezzled money, Kpomo is not the cause of our numerous problems in Nigeria, so the government should please leave our Kpomo alone! I am not surprised by your very informed comment coming from an Agric-Economists point of view. I’m not sure all those factors you mentioned have been considered in taking this decision. Thank you Tosin for shedding more light on this. Lol, not sure if that was really agric economist point if view or just annoyance as to why the everyday man has to bear the brunt of decisions imposed on them for reasons they can’t even comprehend. Just because the people perceived to matter won’t be affected , then it is ok . Change cometh!!!! Lmao!! I want to believe this is not true (banning of ponmo). I will personally wring the necks of those that suggested the crap like I wring my wet laundry. Kilode? Ponmo has come to stay and stay it must! I’d personally hold up a placard against the ban. I’m not a ponmo addict but at the same time, I can’t bear not seeing it around. Let’s all say NO to ponmo ban. The government should go back to the exportation of cash crops. Loool, easy Bibi…easy. I’m glad I’m not alone in this anyway. I’ll honestly consider carrying a placard too. Kpomo must stay! Thanks Bibi! On a 2nd thought, there must an anthem for this ponmo thingy. Even a pledge.*wink*.. Clearly, these “policy makers” have not seen the true meaning of a hungry man being an angry man. Ban kpomo?? I laugh out hard in all languages. I heard of this and simply summarised it as “rough play”. It is just very unfortunate that our leaders have over the years developed the attitude of policy formulations without an iota of care for the common man at the receiving end. The ban in essence is to increase export volumes of the product and increase foreign exchange inflow into the economy. We have heard these stories over and over and it has not impacted positively on the lives of the poor man. This country is truly “God’s own imagination of an impossibilty”! Long live Kpomo! Thanks Semmie! Well, I believe its just a proposal. With the kind of public outbursts that greeted that proposal, I doubt that the government will implement it. How can they ban the consumption of `Kpomo`? What then will remain? When ebola has taken `bush meat` and red meat is widely speculated as unhealthy in relation to #cancer #heart diseases #kidney diseases et al. Poultry is not affordable and so are others. Even the `Kpomo` is no longer as affordable as it used to be in years past. Meaning that gradually, farmers are beginning to realise and relish the economic value of hides when not eaten. Very sad. Let’s just hope it ends as a proposal. Well said ma, thank you very much. Yes o! They should just leave our Kpomo alone for us. Thank you Anwuli. ponmoooo ponmo, ponmo is necessarrrrry necesarrrry …ponmo carry history….copywrite from ds musician wizkid abi na olamide sef. Ponmo got history far far back of our greatgranies o.They shd let it be.Even without d nutritional value,ponmo stil make sense a lot inside vegetables o. Increase foreign exchange inflow into the economy is still in their own self interest. welldone Lolo. Lol @ we boil our foods 2 submission. If dey want 2 ban kponmo let chicken n fish b everywhere like sachet water. In a country where even d kponmo s nt affordable 2 abt 30% of d populace. Instead of carrying out researches on how 2 beef up kponmo wit some nutrients so dat d poor can get sometin out of it. I doubt if our leaders knw d xtent of poverty in d land. its heart breaking joor. Nice write up. Abi o Biodun. Don’t mind them jare. By now, I have concluded that it was just a huge joke. Thank you.